The wedding day is a special day for the couple who is about to enter into a lifelong relationship with each other. Though it is an important day for both the partners, for the bride it is D-Day of her life. Although many people may take this as a sexist comment, it is just that girls are more sentimental about marriages as compared to guys. As such, there are many superstitions with respect to a bride. Some of these superstitions are linked to the health of the couple, some to the success of their marital life and soon. The Wedding Dress Should be Kept Hidden : A bride-to-be has to keep the wedding gown hidden from the groom until the wedding day. It is said to bring bad luck if the groom happens to see the dress before the wedding day. The Groom Cannot See The Bride : On the final day, the groom is not allowed to meet the bride until the time she walks down the altar with her father. Something Old, Something New, Something Borrowed, Something Blue : This is one of the popular superstitions associated with the bride. As per this, a bride is supposed to carry a new thing, an old thing, a borrowed item as well as something blue on her during the ceremony. A Six Pence In The Shoe : According to an old belief, it is said that if the bride keeps a six pence into her shoe during the ceremony, it will bring wealth & security. Engagement Ring : Various superstitions are correlated with the engagement and the wedding ring. Like the engagement ring and the wedding ring should not be bought on the same day. The other says that the wedding ring should never be removed completely from the bride's hand. One more crucial superstition that every bride strictly follows as not letting anyone tries your wedding ring as she will be the one who will steal your husband. Spider on the Dress : It is believed that finding a spider on the gown of the bride is a sign of good luck for the couple. 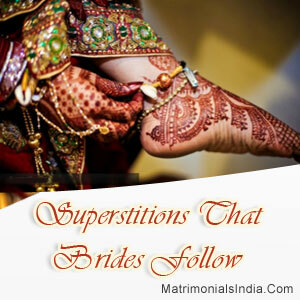 These are some of the popular superstitions associated with the bride & her wedding day. Though most people think of it as nonsense, many of these superstitions actually have deeper meanings associated with them. But that does not mean that they should be taken at face value or not following them will cause trouble. In the end, what matters most is that the bride & groom are happy.